True confession: I started going through Gov. Bill Richardson’s latest list of presidential campaign contributors on the Federal Election Commission Web site Tuesday morning before I even made coffee. That’s pretty pathetic. I know. Actually, it’s probably a good thing I wasn’t drinking coffee when I came upon a name on the second page of Richardson’s Third Quarter contributor list. I probably would have spit it onto my computer. Blackwater LLC, P.O. Box 606, Aynor, S.C. $500. Blackwater! Could it be that Richardson, who has morphed into the most anti-war Democratic candidate this side of Dennis Kucinich, is actually taking money from the security company that’s been accused of shooting down innocent civilians in Iraq? Blackwater LLC is operated by the J. William F. Holliday family in Aynor, S.C. An employee answering the phone there Wednesday said the name “Blackwater” is a reference to the Little Pee Dee River, which she said has a lot of black water. More baseball blues: America’s pastime might come back to haunt Richardson in the World Series. His comment on Meet the Press this year that he’s both a New York Yankees fan and a Boston Red Sox fan caused dismay among rabid fans of both rival teams. But if the Red Sox make it to the World Series, the Western-governor candidate, who proudly brings up his “westerness” every chance he gets on the campaign trail, will be in the position of having to root against our neighboring team, the Colorado Rockies. 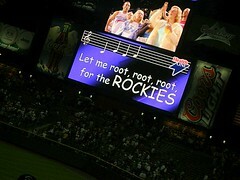 Not only are the Rockies the closest thing New Mexico has to a “home team” in major league baseball, but their 20-out-of-the-last-21-games winning streak is a true Cinderella story. If Richardson tries to say he’s both a Red Sox fan and a Rockies fan, I don’t think anyone in New Hampshire — which considers the Sox their “home team” — would forgive him. If the Sox pull it off against Cleveland, I bet Richardson takes his chances being the Western governor who roots against the Rockies. But he might have some explaining to do at the Democratic National Convention next year in Denver. That pesky Senate question: The editors at The New Republic have made one of the strongest statements seen in the national media in favor of Richardson’s dropping out of the presidential race and running for the U.S. Senate. 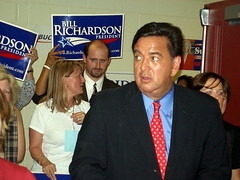 “Richardson’s presidential campaign has failed to take off,” the editorial, published Wednesday, said. “He’s mired in the single digits in the polls, and — barring the simultaneous collapse of Hillary Clinton, Barack Obama, and John Edwards — it’s hard to see how he’ll capture the Democratic nomination. ... Put a fork in Richardson ’08; it’s done. The editorial notes Richardson has dismissed all requests for him to run for the Senate, insisting he’s going to win the White House. Musical judges: The announcement of Richardson’s appointment of Albuquerque lawyer Charles Daniels to the state Supreme Court on Wednesday left out an important part of Daniels’ career. He’s a musician. No, he’s not the same Charlie Daniels who sang “The Devil Went Down to Georgia,” but he did play bass for years with a country-rock band called Lawyers, Guns and Money. According to one of my sources in the state judiciary, the justice-to-be also has played in a band with a couple of former judges from Albuquerque, Woody Smith and Tommy Jewell. Maybe Daniels can get together for some courtroom jams with Appeals Judge Rod Kennedy, who is known to pick and sing and write songs.